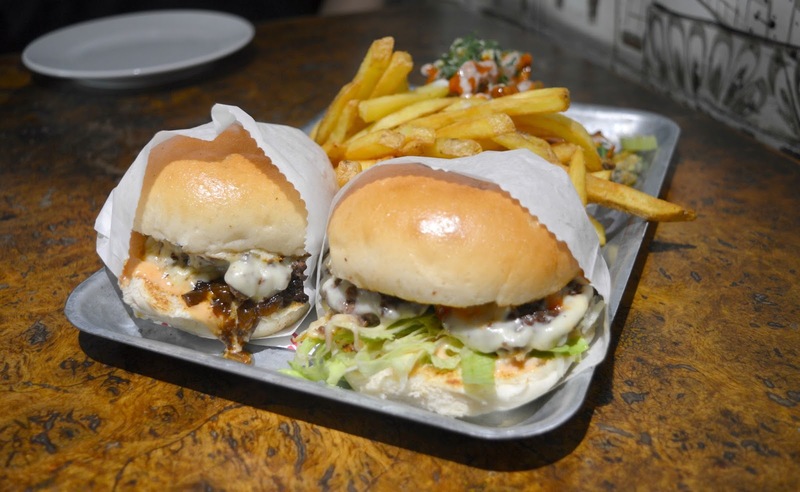 A question I've asked myself a number of times since I first heard the whispers that they serve up the best cheeseburgers in the city, a bold and proud statement that you'll even find written on a blackboard outside their temporary home at No. 28. The Grind have been a regular on the North East street food scene for a while now but it was once they opened a pop up restaurant in No. 28 at the Grainger Market that I first started to hear a real buzz about their burgers. 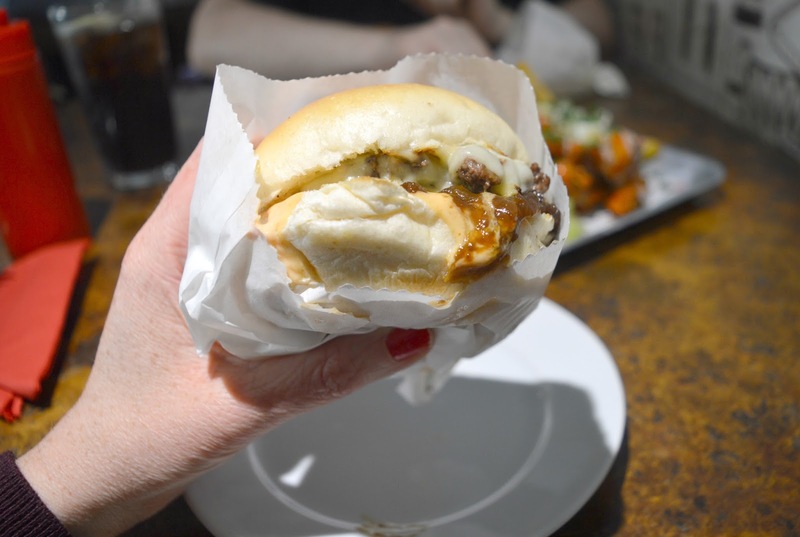 Rumours of amazing patties, epic amounts of cheese and lush sides began to pass between the Newcastle foodies and I was keen to see what the fuss was about. So what took us so long to get to the Grind? 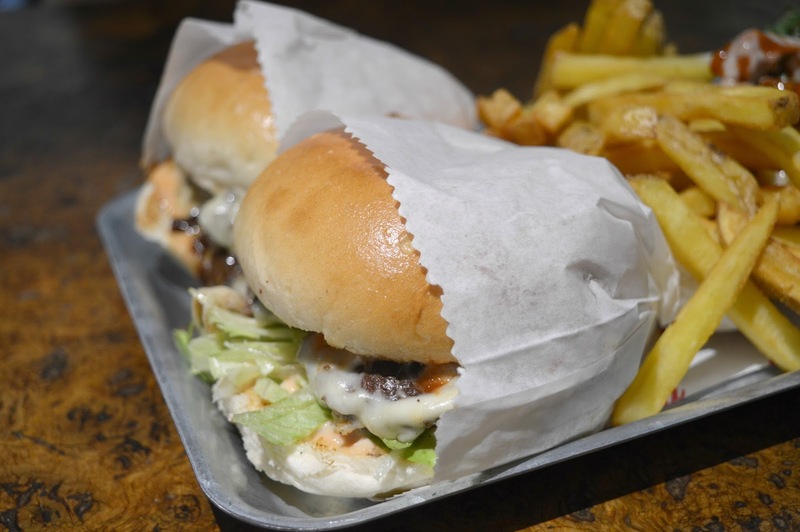 Simon is fiercely loyal to our favourite burgers in the North East, Fat Hippo and he was adamant he didn't want to cheat on them! Whilst it's great that I've married a guy that's so faithful I was keen to be a little naughty and give the Grind a go and eventually I managed to wear him down. I was ready to make the Grind my cheeky little "bit on the side"! Trying to find a menu for the Grind online is tricky, I've seen them at various food festivals and markets across the region so had an idea of what was on offer but was curious to see if the menu at No. 28 would be bigger and better! I couldn't wait to see exactly what was on offer! So when we actually got our hands on the full menu when we sat at our table in No. 28 I was feeling pretty chuffed (for those of you who are curious there's a full menu displayed outside No. 28 I don't know why I'd never thought to look before!) 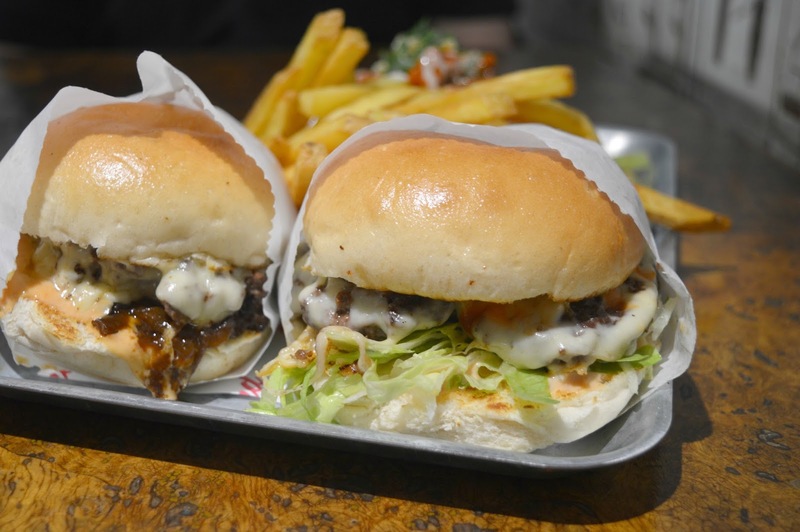 The menu is made up of an impressive seven cheeseburgers as well as sides, sharers and sweets. We were happy and everything sounded so good that making a decision was tough. After a lot of thought (and Simon almost accidentally ordering a vegetarian burger - hilarious) I opted for the Mid Western (£7.00) - Grind style butter burger with French onions, whipped garlic and miso butter and Simon went for the West Coast Classic (6.00) - served with lettuce and secret sauce. Deciding on what sides to order was even tougher than choosing a burger. I almost went for the amazing sounding Truffle & Parmesan Fries (£4.50) but in the end we both chose the Solo Beef Dripping Fries (£2.50). As a cheeky extra we also ended up with Buffalo wings (from £5.00) as they accidentally added them to our order in the kitchen! Result! Our food turned up on a huge tray to share, it looked pretty damn impressive but I have to say sharing a tray of food with my husband can be a little stressful as he eats so much faster than me. If I don't keep an eye on him I end up with no fries! So how were our burgers? They were amazing! Firstly I loved how the burgers came perfectly wrapped up in a little parcel, it made picking them up to eat almost effortless - sure I still ended up with hands covered in sauce and cheese but it encouraged me to really make a good go of eating with my hands (I'm usually one of these annoying people who eat burgers with a knife and fork!). As soon as I'd taken a bite of my Grind Cheeseburger I could understand what the fuss was about. The meat was served slightly pink and was so full of flavour, the cheese was plentiful and oh so stringy and as for the French Onions - Oh wow! I think my favourite part of the meal however was the Beef Dripping Fries. They were so crispy and very moreish and we almost fell out a few times over who got the last few off the tray. They were lush! We weren't quite so taken with the Buffalo Wings but I know that many others rave about them. Neither of us are really that fussed with chicken on the bone and we also found the sauce covering them to be slightly too spicy. That's just our personal preference and I know that others love them as much as the burgers! So I cheated on Fat Hippo and how do I feel? Pretty darn good! Being a girl with a huge appetite, there's plenty of room in my life for two burger loves. We loved our first visit to the The Grind and we'd love to see them open up a proper restaurant in Newcastle soon! So, the big question! 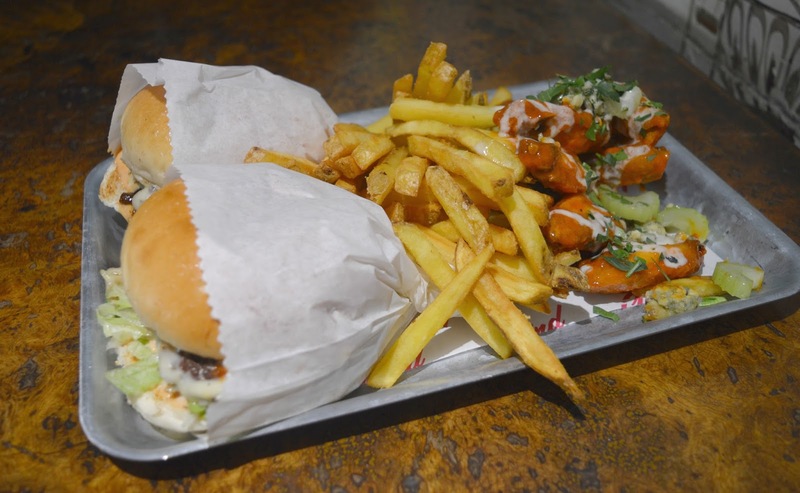 Where do they serve your favourite burger and, if you're in the North East, do you prefer Fat Hippo or the Grind? Loved this? For more foodie inspiration across the North East follow New Girl in Toon on Facebook and Instagram. I've been meaning to try here for ages too. Good to hear you rate it as I trust your opinion.